This rustic house is more than 200 years old and has been fully renovated. It is located in the Maiella national nature reserve and has a fantastic view. 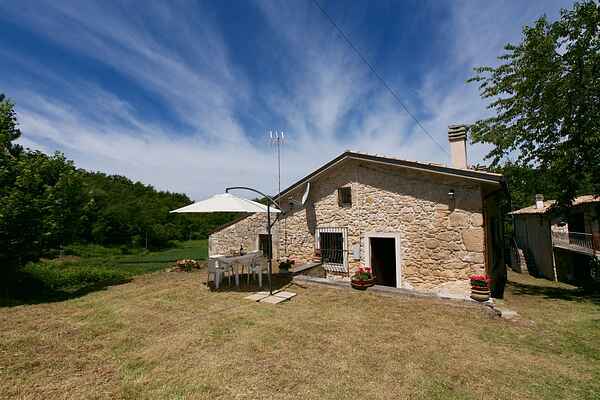 The house is located at an elevation of approximately 650 metres and is approximately 2 km from the village of Roccamorice, originating around the year 1000. There are a few other inhabited rustic houses around the house. The surroundings are breathtaking and consists of meadows and mountains. The high, ragged mountains with the deep ravines, clear rivers and impressive cliffs are beautiful for walks in pristine natural surroundings. There are many animals such as bears and wolves. In addition, you can mountain bike, visit medieval towns and take a trip to the Adriatic coast to swim. You'll find a swimming pool twelve kilometres away, a tennis court thirteen kilometres and fishing lakes and a golf course forty-seven kilometres away. You can enjoy walking, jogging, mountain biking and climbing in the immediate area. The shared swimming pool is 4 km away from the holiday home.